Does PIOMASS verify? | Watts Up With That? Pursuant to the previous post on The great 2007 ice crunch – it wasn’t just melt this is a follow up post for questions raised there. One of the favourite web sites quoted by the AGW faithful, is the University of Washington PIOMASS site – which claims to model ice volume. 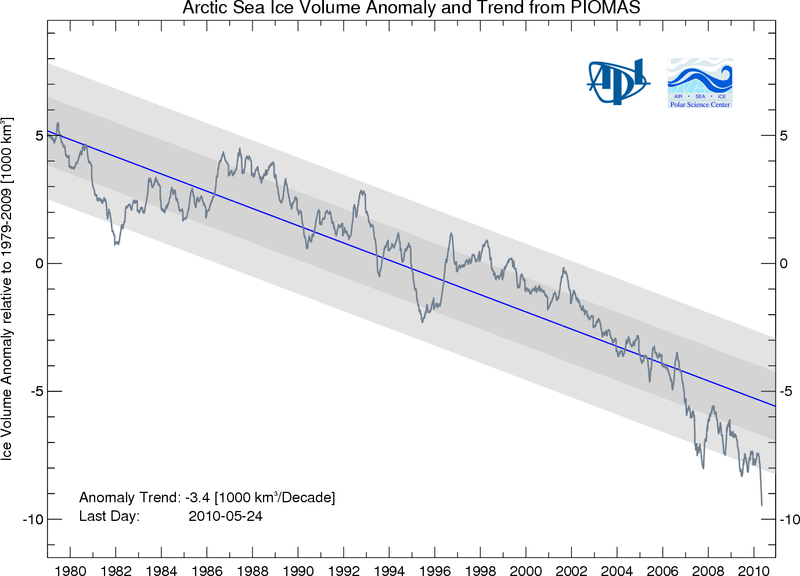 They show ice volume dropping off precipitously after 2006 and continuing downwards. On their web site they include the verification graph below, which curiously stops verifying in 2007. Obviously they have run their models post 2007, so why did they stop updating their verification? The image below gives a clue. I mapped NSIDC November extent (blue) on top of their verification graph, and something stands out like a sore thumb. Ice extent jumped back up after 2007, but their volume model didn’t. Below is another one of their verification links, which actually verifies nothing because it only compares their model vs. extent. Since they undoubtedly fed the extent data as an input in to their model, it is rather bizarre that they would present this as verification evidence. It is like predicting the score of a game after it has already been played. So let’s try doing some real verification. Below are the Navy thickness images from November 2007 and 2009. 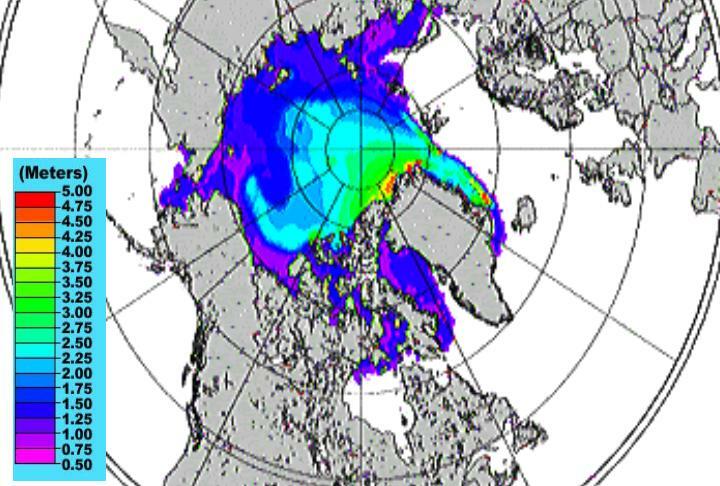 Note that across the majority of the Arctic, 2009 thickness is greater than 2007. Notable exceptions being the 2007 pressure bump in the Beaufort Sea, and along the north coast of Greenland. Conclusion: The PIOMASS models are probably not an accurate representation of current ice conditions. Most of the Arctic has increased in thickness since 2007. ← Study concludes: "major hurricane could devastate the Houston/Galveston region"
The conclusions should be the focus of more research and a paper. Good work. The Rotten Ice meme just got a bit thinner. Although it seems likely from the images that volume has increased, I can’t really tell for sure. The top half of the circle seems to have lost quite a bit of volume, while the bottom half seems to have gained. Is there any way to quantify it? In the top half, some large areas went from light blue to dark blue, or from dark blue to purple, both of which are in the direction of less thick. This is probably offset by gains in the bottom half, but it’s hard to tell by eyeballing it. Is NAVO going to be a new favourite web site quoted by the AGW unfaithful ? Too bad they don’t verify their ice thickness data. Wow, two in one day in Central America. Is California next with perhaps an earthquake? Another model for the advocates to claim has value that is based on conjecture/ Assumption / WAG! Oops, I was reading it backwards. In this case, my comment is reversed: the gains are in the top half and the losses are in the bottom. Same problem, however. I think ICESat stopped working by then – not sure! – which was the point for the (delayed) Cryosat launch. Tchoh!, There you go with things that have actually been measured. How on earth are you going to convince anyone with that compared to “Rent seeker magical modelled land”? Like flipping trendlines, PIOMASS is “hiding the advance.” Circular reasoning, convenient cutoff points, have been typical of Green Gang hysterics since 1988. Select -> by color — then click on an area of color & copy it to the clipboard. As of October 11, 2009, Laser 2 of the Geoscience Laser Altimeter System (GLAS) onboard the ICESat satellite stopped emitting light pulses. Since this time, no new science data have been returned from the GLAS instrument. Currently, a GLAS Anomaly Review Board has reviewed and assessed the situation and a series of attempts to restart Laser 2 has been initiated, to be followed by attempts on the other two lasers which stopped working earlier in the mission. 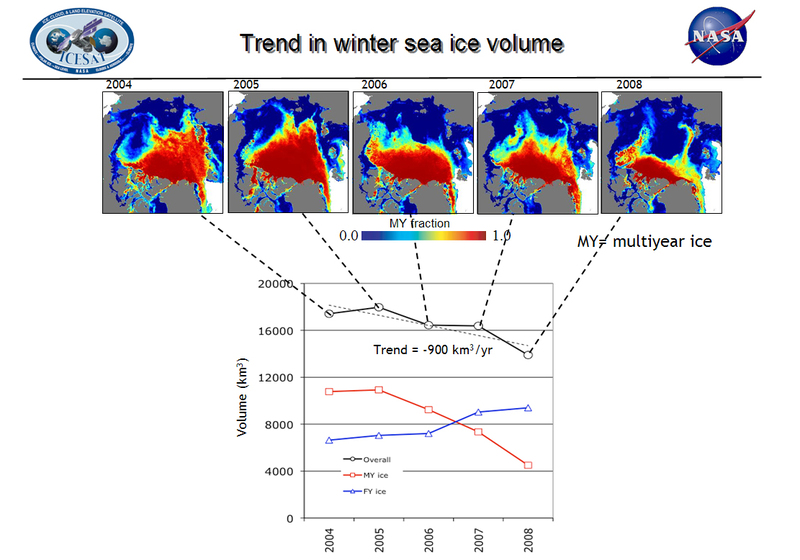 ICESat shows an increase in first year ice in 2007 and 2008, which explains the increase in extent, although total volume held steady in 2007 and was down in 2008. How excactly does the navy measure ice thickness directly, without using models? The Navy also uses a model, and does not have direct data over the whole Arctic, and no one will until Cryosat2, and in fact the current Navy model PIPS 2.0 will soon be replaced by a “better” model, PIPS 3.0 which will be updated to use the same Los Alamos CICE modeling algorithms as PIOMAS. Observations from satellites, Navy submarines, moorings, and field measurements are limited in space or time. The assimilation of observations into numerical models, currently provides one way of estimating sea ice volume changes on a continuing basis. Volume estimates using age of sea ice as a proxy for ice thickness are another useful method (see here and here). Comparisons with observations help test our understanding of sea ice conditions in the Arctic. So basically, they try to get an idea of the big picture from a small set of samples. The ICESat measured volume by using a laser to measure the height of ice/snow, compared to sea level, then used Archimedes law to determine how much must be under water. From this the volume is determined. Unfortunately it suffered a malfunction and a replacement isn’t planned to be launched for some years, from what I’ve gathered poking around the NASA site. Looks like most of the thicker ice, is in no danger of being driven out through the Fram Strait? My main concern being the polar bears, of course. First thing I notice is the scale is in 1000 km^2. A 1000 kim^2 isn’t very much relative to an icecap extending millions of km^2, especially when you think about the fact the we were coming out of a bottom and climbing to a peak temperature-wise over the period of the graph. It is a travesty that anyone would call for more federal funds to study something like this at a time when we’re running a deficit of more than $0.01, not to mention > 10^11 times that amount. You may have noticed that appeals to authority don’t carry much weight around here. We will pay approx 1 billion dollars to Indonesia. Why; Indonesia has promised to cut down less rainforest. to cut down the rain-forest…..
we would have cut down 2 million trees”. I hope they are *not* working under a government funded grant to measure the effects of ‘Climate Change’ on the Arctic ice-pack. Way O/T, but maybe the petroleum engineers who post on here will have an answer. Watching the mesmerizing log-flame-like image of the gulf oil leak, I can’t help wondering if they haven’t thought of just hooking a high capacity multi-stage centrifugal pump up to the BOP and running sea water in at a rate that just overcomes the pressure of the oil to hold off the oil flow until they can complete the relief wells in a month or so. Such pumps are available but maybe not with a prime mover capable of being run 5000 ft down. But, such a pump could be coupled to a water driven turbine which could be powered by high volume low pressure water that could be pumped down from the surface. And we know ad hom’s aren’t tolerated here. Looks like we just took away the CAGW crowd’s two best weapons. LOL! No matter how you slice it, the Arctic is warming. 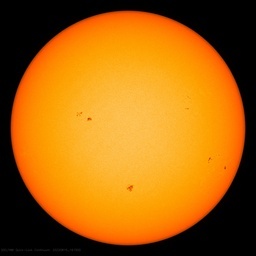 At issue is not whether it is warming but what is causing it. As I pointed out, the abrupt beginning of warming rules out the greenhouse effect. It is completely impossible for atmospheric carbon dioxide to start a sudden, massive warming trend unless its partial pressure simultaneously takes a jump, and this did not happen. Which leaves ocean currents as the only way to start a sudden warming over a geographically large area. The break in warming between 1940 and 1960 fits in too because the simplest way to produce it is to temporarily change the configuration of currents. Which brings up the possibility that if it happened once it can happen again. Hence, a refreeze of the Arctic at some future time is not out of the question. “Looks like most of the thicker ice, is in no danger of being driven out through the Fram Strait? I always thought the polars bears needed “rotten ice” to hunt seals as they came up through the breathing holes; good solid thick ice means they starve! 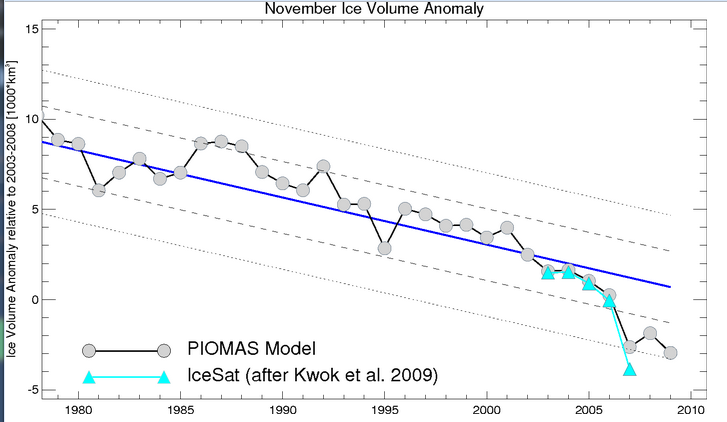 The only way the PIOMAS charts/model can be right is if ice thickness has declined by about 50% since 1980. Furthermore, the seasonality of the average ice thickness has to have switched from the early 1980s when the average thickness at the sea ice maximum (in March) actually INCREASED during the season until it the sea ice minimum (in September) whereas today the average ice thickness declines from the maximum to the minimum. Does the Cryosphere Today area chart look like the thickness has declined by 50% and the average thickness of that ice switched seasonality trends since the 1980s – Nope. Notice the keys on the map. First year ice can vary quite a bit in volume. Which leads me to point out that volume cannot be straightforwardly deduced from ice age. The models have that variable wrong. They need to model ice thickness based on concentration (potential for compaction), and wind direction and speed (potential for pressure ridging), to model potential thickness/volume. Of course you need to be able to predict the wind. Good luck with that one. Ice melt potential is a weather pattern prediction. If the winds are strong enough and the ice has sails on it, the Arctic can flush thick compacted ice just as easily as it can ice cream. Good luck with that one. 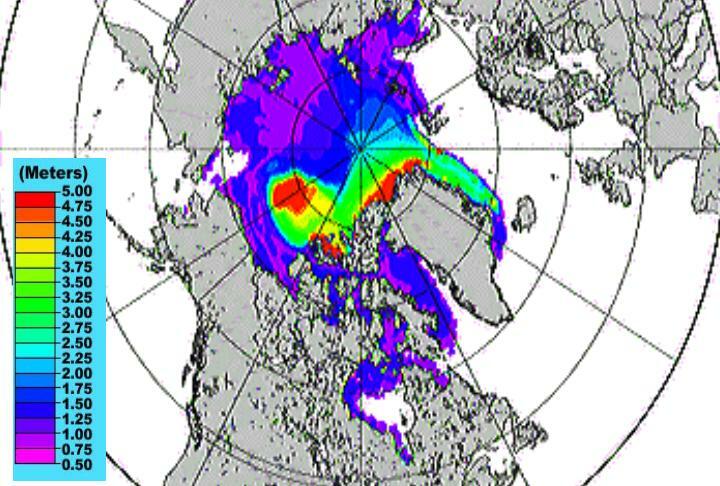 Cryosphere Today provide comparisons of sea ice “concentration”. Comparing May 23 2007 with 2010, concentration is clearly higher this year than in 2007 (solid purple compared to purple with white blotches). Thanks to Juraj V for this link from an earlier thread. Now how bizzare would it be if “sea ice concentration” correlated with thickness or even volume. So I guess Cryosphere Today has to be added to the list of pro-skeptic sites and dismissed as inaccurate. The data are directly opposite to the PIOMASS model calculations. Whence this discordant cacophany? Someone is singing from the wrong hymn-sheet. Wait a little longer and you’ll be able to up that debt exponent again. Where are the warming trends? Under the table? No, not there. George, do you have a pixel count on the colors? It is not obvious to me whether there is more or less ice in 2009. Or someone else? It will be 11,000 years before the Arctic is ice free in September. Maybe it will be called the Older Anti-Dryas. Well, presumably PIOMAS stopped calibration because ICESAT died. Also presumably they are trying to suggest how conservative they (think) themselves to be by showing that the PIOMAS model actually shows a *higher* volume than the the last ICESAT thickness reading suggested. So the implied messaging for post-2007 is “Hey, if anything we’re probably too high”. I don’t hate on PIOMAS. But it is what it is, and no one should expect it to be more than it is with that limited amount of calibration. Another 10 years of data from the Euro satellite and they might have something worth putting at least a little bit of reliance upon. I’m a huge fan of iteration. I really am. But there are no shortcuts. You can’t get from there to there without going thru all the points in between. Have you found a way to download their raw data? I’d be interested to see those. From just eyeballing the trends in their unofficial graphs, it mostly looks like things are warming. There’s another prediction, to put alongside Watts’ prediction that ice extent will recover this year, or Goddard’s linear projection that September ice will be gone in 2065, or Serreze thinking by 2030. So we’ll watch nature and see whose hypotheses she supports. Just eyeballing it, Steve, I can’t say I find that obvious. And even if it’s true, there’s the question of how thick and what the total volume is. There are some red patches (5m) for 2007 that look to be around the size of mainland Britain, c. 200 km^2, and maybe more green and yellow and it’s hard to compare extents precisely. Maybe you have some figures to back up what you say? I’m not doubting you, just saying that eyeballing doesn’t do it for me. Better keep on eye on nsidc arctic ice extent – it’s dropping like a stone. Exactly what we’d expect if the majority of recent freezes are only 1-2 years old and very thin. OMG!!! I just saw the lastest anomlay for the Antartic on Cryospheres website. Its very clear from this that Antartic ice is in a reverse death spiral and the next ice age is just round the corner but thankfully will only affect the Southern Hemisphere. As I mentioned in the earlier article, the Navy’s PIPS analysis shows a 20% volume loss from 2007 to 2008. Both PIOMAS and PIPS show the arctic ice has lost more than a third of its volume at maximum melt during the last decade. Why do you think they are both wrong? As I mentioned many times, why are you setting up a straw man? I never mentioned anything about the last decade. What I am questioning is the last three years. That’s about right, from a winter thickness of 3.6m in 1980 to 1.9m in 2009. PIPS 2.0 became operational in 1995 and superseded all earlier forecasting systems. It is the first fully coupled, operational, ice-ocean nowcast/forecast system in the world. It combines the Hibler ice model technology of the earlier PIPS with a Bryan-Cox ocean model to provide more accurate 5-day ice forecasts. PIPS’ use of remotely sensed data from assimilation in ice/ocean prediction is also a first. Although satellite data have previously been used by the high-latitude scientific community for model validation and verification purposes, NRL’s team is the first to make use of satellite-derived ice data (ice concentration) as part of a data assimilation technique used to initialize ice/ocean forecast systems daily. Yup, input some nice “satellite-derived ice data (ice concentration)” data to the ice/ocean model, and presto, out comes ice thickness. In a nice “image” format. How’s that PIPS 3.0 coming along ? And who started the development of PIPS 3.0 ? Why, it was Dr. Wieslaw Maslowski , of the Oceanography Department, Naval Postgraduate School. Finally, someone from the Navy is speaking out on the Arctic sea ice death spiral. Also very involved with CICE. the naval post graduate school has also been politicized! 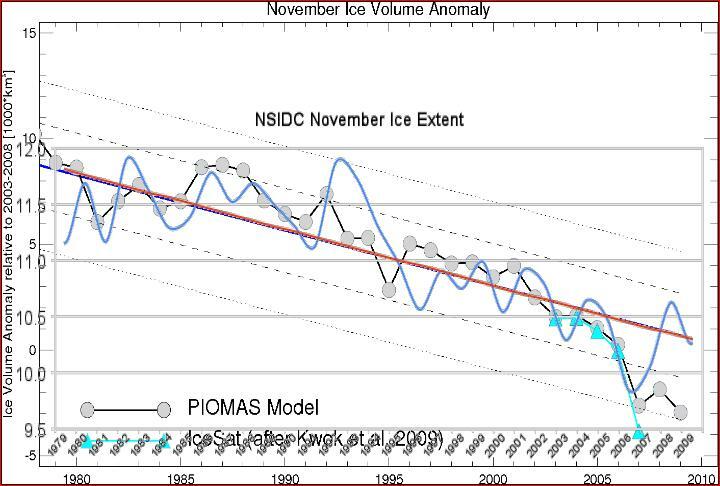 If you draw a line from November 2007 to November 2009 on the PIOMASS graph you get a slight recovery in ice volume which is perfectly consistent with the Navy images you gave?! This is because November 2007 was a record low ice volume month while November 2009 contained a small recovery peak in ice volume before it moved down again. Whats all the hoopla about? It is clear that the Arctic has warmed over the period of satellite measurements, and by three to five times as much as the planet as a whole. You are aware that Professor Wieslaw Maslowski forecast an “ice free Arctic” by 2013? Now that you have shown your admiration for him, I will have to hold you to his prediction. I’m glad It looks like we’re agreed that both the Navy PIPS and the UofW PIOMAS teams have published figures showing that a large proportion of the September ice volume has been lost during the last decade. You have never before suggested such a loss had occurred before, in fact quite the opposite, so it’s hardly a strawman. It is a model check the home page here. I have wondered how the extraordinary low of 2007 affects where the model goes moving forward. Your point may be true but there do seem to be some serious inconsistencies between PIOMASS and PIPS (the Navy model). Take some widely spaced time points say near the yearly maxima in 1999 and 2010 (March 1st). The navy images look almost identical. it’s the long term trend that matters, not the year to year noisy fluctuations – aka “weather”. I’m sure you’re well aware of that Steve, yet in your posts you insist on making big deals out of short term fluctuations. Does a skeptic prediction model exist that predicts that the ice will stop shrinking decade by decade? That might actually qualify as a legitimate contrary piece of information. Ah, the folly of trying to use linear trends on a climate metric which is driven by deterministic chaos! To make matters worse, sea ice is an inhomogeneous fractal structure, whose Hausdorff dimension varies considerably during the polar melt/freeze season, so extrapolating/averaging from physical measurement is unreliable. Perhaps no surprise that we don’t know the real sea ice volume each year. I’m amazed the even some of the ‘best’ climate scientists don’t understand this simple point, with some continuing to panic about the Arctic sea ice ‘death spiral’, despite the observed recovery in both area and extent since 2007. Fools!!! It’s thought worse than wee. I would like to know more about what the underside of the ice is like. Years ago I saw an illustrastion of a sub picking its way through a very irregular ceiling, which included some nasty-looking points jabbing downwards, and also thin channels (frozen leads) which it could rise up into to hide, and also break through for air. More recently I’ve seen illustrations which make everything look smoothe, on the underside of the ice. Is there a WUWT reader who served on a sub under that ice, who can end my curiosity about the nature of the underside? Any estimation of volume needs to take into account the fact that nine tenths of a floating slab of ice is under water, and a pressure ridge that sticks up six feet should, in theory, stick down fifty-four feet. Nothing but a grown up kids silly game! Area and extent are not the same thing. Area is the measured area of ice, and extent is the area of ocean with a defined (15% or 30% normally) ice concentration. Ice extent is always larger than area. Graphs of average and range overlayed with temps since 1990 have been posted for Anchorage. Show me warming. Just out of curiosity, what does the last ‘S’ in PIOMASS stand for? The linked site (Polar Ice Center) has PIOMAS = Pan-Arctic Ice Ocean Modeling and Assimilation System. Multiyear ice can be very uneven on the underside. First year ice is generally smooth except for cracks. How can you compare the Navy model results when THERE ARE NONE. It is a tool for Icebreakers. It does NOT sum total Ice Volume. You look at the Navy Picture show & say “obviously thicker”. But the pic you show for 2007 has less medium Ice but MANY TIMES THE REALLY THICK STUFF IN RED cf to 2008. So: What is the Volume number ? The Navy model gives none. So you do not know & neither do I. When PIOMAS showed a LESS EXTREME MELT than ICESAT. Please stop saying they are Crooks. Their model UNDERESTIMATES ICE LOSS. If they were crooks it would Overestimate it. My background is History & when “denier” Dr. Roy Spencer apologizes for his high temps from the Uah site, he shows he is Honest because he presents Data the OPPOSITE of what his bias is. Hansen is at least better than the European/Mann Frauders who never admit they were wrong, because when Stephen MacIntyre pointed out the famous error that put 1998 over 1934 for USA temps, he looked at the numbers, and made Stephen famous by going back to the old ranking. It is called “Argument Against Interest”. It does not indicate COMPETANCE — Hansen’s Forecasts are Notoriously BAD — but when every major GREEN Scientist condemns Cap & Trade (“Gaia” Lovelock, Hansen, “Dr. Ozone” Paul Crutzen, we can Trust it. Piomas can “assimilate” Data to show the present situation as well as limited plane & ship coverage can. It is mainly used by modellers inputting assumed FUTURE data to get a Forecast but so What . It’s not really the Best measure of Ice Volume — it is just the ONLY ONE. Yes, thank you for the same link that I included in my “May 28, 2010 at 9:09 pm” Comment. A link that I included a section of quotes from, since many readers don’t bother to click on links. The goal of PIPS 3.0 is to update PIPS using the latest physics and computational advances in a parallel computing environment. Now that you have shown your admiration for the Navy PIPS model output, with ice thickness mysteriously “verified” using Special Sensor Microwave Imager ice concentration data, I will have to hold you to the data of the new, improved PIPS, as designed by Dr. Wieslaw Maslowski. But keep writing about how “reliable”, “trustworthy” and “verified” that Navy PIPS data is. Yes, we can both agree on how rock solid the Navy data is – why, there are lives at stake, thousands of submarine commanders with no sonar desperate to surface through sea ice of unknown thickness. Later this summer, after PIPS is a WUWT favorite, I’ll show you some PIPS 3.0 results I’ve found. You’re not going to backpedal and claim that PIPS 2.0 is “better” than the latest Navy model, are you ? It’s the Navy, and they know what they’re doing. Am I understanding that verification of PIOMASS happened only for 5 recent years? So what does the PIOMASS model say the ice volume was for 1906 when Roald Amundson successfully navigated the Northwest passage without an ice breaker – something I understand no one else managed again until 2007, then again in 2008, and it closed back up in 2009. It sounds to me like the arctic ice cap is repeating what it did just about exactly 100 years ago. What melted enough ice to open the northwest passage 100 years ago since CO2 can’t be the culprit? I learned a long time ago that the same organisation which does an excellent job of data collection, may not do so well with analysis. Seems to be prevalent in this field. You appear desperate to change the subject. So how many Norwegians agreed to labor for the politicians in Indonesia? Maybe you’re looking at this from the wrong side of the deal. If there is a market in conscience solving then it’s only fair that Indonesia should take it’s slice. Companies sell rubbish to people (and governments) every day. It called a free market. I guess the argument will be solved at the end of summer when record temperatures melt all the ice. Will you believe the ice is getting thinner then? Of course it could be just the wind, or maybe all the ice moved to the south pole, or not to worry, this is a normal occurance that has nothing to do with the record increases in CO2 in the atmosphere.